Hi everyone! It's Chrissie. I'm super excited to be back on Catherine's blog today! I had so much fun creating this card. It's one of those cards that's worth every second of the card making process. Here are the step-by-step instructions so that you can easily reproduce this card. Trim one piece of cardstock to 8 1/2 x 5 1/2 inches, score and fold at 4 1/4 inches. This will be the card base. Set it aside. Next, trim another piece of white cardstock, but this one should be 5 1/4 x 4 inches. This will be the main card panel. Set it aside for now. Die cut 10 Cabana Tiles out of white cardstock. Punch out the inner pieces and set those aside for a future project. Keep the outer 10 pieces for this card. On a separate piece of cardstock, create several ink circles. Create 4 of each color: Coral Cabana, Orange Twist, Limoncello, Grass Skirt, Fiesta Blue and Pixie Dust. Die cut each one of these out. Punch out the inner pieces. Those will be used for this card. 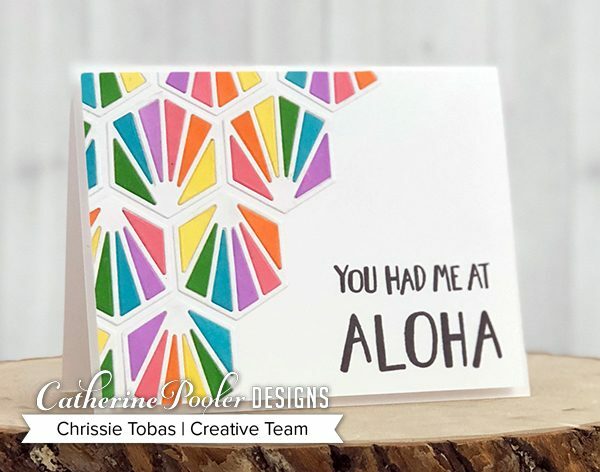 Set aside the outer pieces for a different project (see the Tropically Yours Project Guide for a card that uses these!). On the main panel, stamp sentiment from Tropically Yours in Midnight Ink. 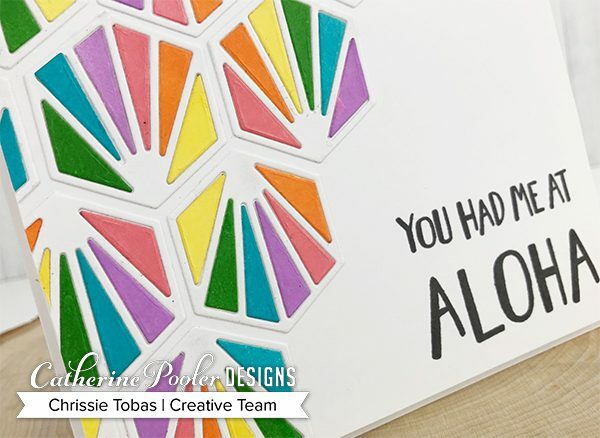 Assemble the die cut pieces onto panel and adhere using adhesive (liquid adhesive is suggested). Adhere white die cuts onto the panel in a diagonal pattern. Add in color pieces into each white die cut. This is time consuming, but also very therapeutic! Trim off excess from the edges and assemble card; adhere front panel to card base using foam squares. Thank you so much Catherine for having me on the blog today! 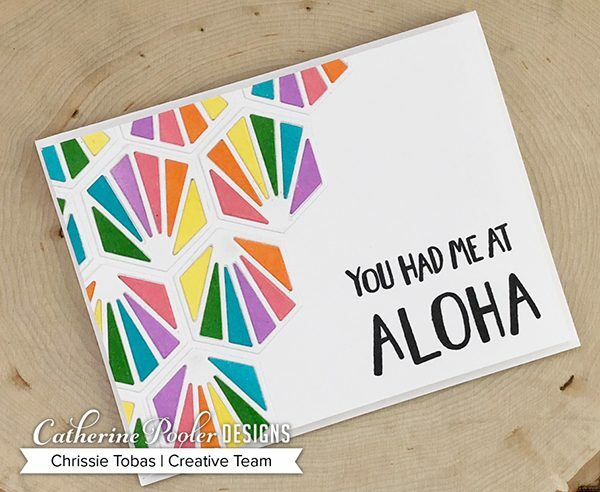 The Tropically Yours Collection is available in the shop while supplies last. 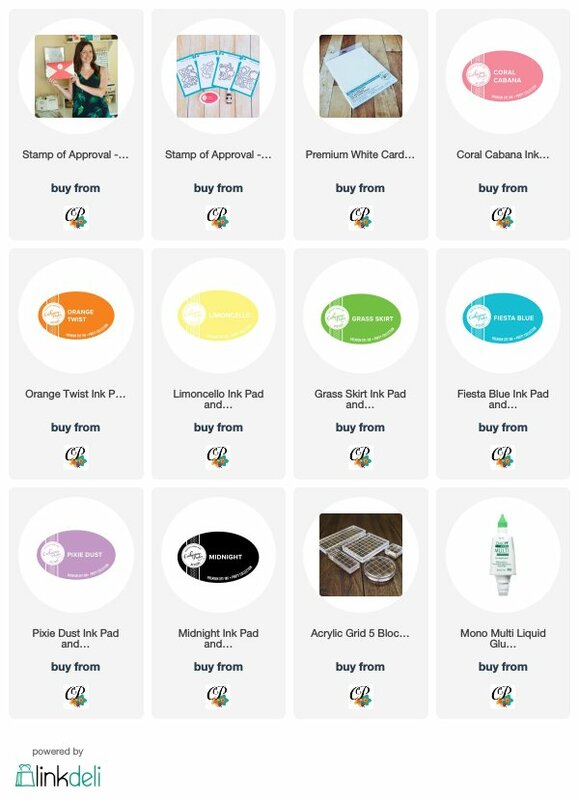 Click here to get yours before they sell out! To see our release videos, click here.